Sloam, James and Henn, Matt 2019. Youthquake 2017. p. 17. Roulstone, Alan 2019. The Palgrave Handbook of Disability and Citizenship in the Global South. p. 339. Stamatakis, Nikolaos 2019. Police Science. p. 52. Dennis, James 2019. Beyond Slacktivism. p. 25. Dennis, James 2019. Beyond Slacktivism. p. 71. Sloam, James and Henn, Matt 2019. Youthquake 2017. p. 43. Wolff, Annika Gooch, Daniel Cavero, Jose Rashid, Umar and Kortuem, Gerd 2019. The Hackable City. p. 153. Cole, Alistair Fox, Stuart Pasquier, Romain and Stafford, Ian 2018. Political trust in France’s multi-level government. Journal of Trust Research, Vol. 8, Issue. 1, p. 45. Grasso, Maria 2018. Young People Re-Generating Politics in Times of Crises. p. 179. Mathé, Nora Elise Hesby 2018. Engagement, passivity and detachment: 16-year-old students’ conceptions of politics and the relationship between people and politics. British Educational Research Journal, Vol. 44, Issue. 1, p. 5. KLEINER, TUULI-MARJA 2018. Public opinion polarisation and protest behaviour. European Journal of Political Research, Vol. 57, Issue. 4, p. 941. Henn, Matt Oldfield, Ben and Hart, James 2018. Postmaterialism and young people's political participation in a time of austerity. The British Journal of Sociology, Vol. 69, Issue. 3, p. 712. Grasso, Maria Teresa Farrall, Stephen Gray, Emily Hay, Colin and Jennings, Will 2018. Socialization and generational political trajectories: an age, period and cohort analysis of political participation in Britain. Journal of Elections, Public Opinion and Parties, p. 1. Mejias, Sam and Banaji, Shakuntala 2018. Backed into a corner: challenging media and policy representations of youth citizenship in the UK. Information, Communication & Society, p. 1. Tonkens, Evelien and Verhoeven, Imrat 2018. The civic support paradox: Fighting unequal participation in deprived neighbourhoods. Urban Studies, p. 004209801876153. Bright, Graham Pugh, Carole and Clarke, Matthew 2018. Young People Re-Generating Politics in Times of Crises. p. 315. Sanghera, Gurchathen Botterill, Katherine Hopkins, Peter and Arshad, Rowena 2018. ‘Living Rights’, rights claims, performative citizenship and young people – the right to vote in the Scottish independence referendum. Citizenship Studies, Vol. 22, Issue. 5, p. 540. There are increasing concerns about changes in society and the economy which are undermining the effectiveness of democracy and weakening traditional conceptions of citizenship. What does it mean to be a British citizen in the early part of the twenty-first century? 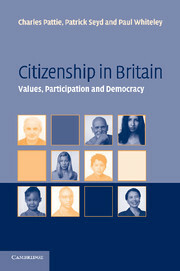 This book presents the first major empirical study of citizenship in Britain, comprising surveys of political participation and voluntary activities, and of the beliefs and values which underpin them. As well as presenting new data, the authors provide a sophisticated discussion of the concept of citizenship, and the consequences of a lack of civic engagement in a modern democracy. It examines why some people are 'good' citizens when others are 'bad' and it explores the consequences of citizenship for policy-makers and democracy. Comprehensive and accessible, this book makes a major contribution to our understanding of civic attitudes in Britain today and will appeal to students, researchers and policy-makers. 1 - What is Citizenship?